Two eye catching offerings from Ryan Weeks that show the contrast between his designs. The S&R has a bit of a “modern Nessmuk” look with an elliptical design. Alongside the S&R is the Lorien, showing a Bowie-style knife with hardwood handle scales, both with beautiful hamon lines that are characteristic of Ryan W. Knives. 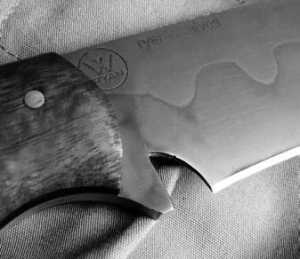 Upon first seeing Ryan’s knives, and their stellar craftsmanship, I noticed a big “W” etched into all his knives. 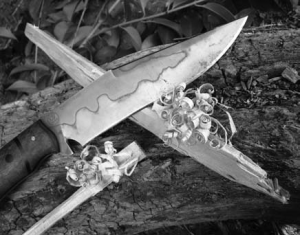 Custom knife maker Ryan Weeks said, “Every knife I make is a tribute to my grandfather. The ‘Crossed W’ in my logo is his Livestock Brand. It serves as a reminder to take pride in your work.” Ryan was greatly influenced by Grandpa Willie, not so much in a technical way, but by the way he lived his life. Ryan said his grandfather was a “do-er” and applied his life lessons to his blade work. 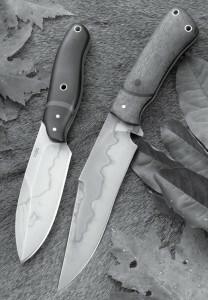 The High Uintas knife is named after the High Uintas Wilderness located in northeastern Utah. The Uinta Mountains were named for the Uinta at Indians, early relatives of the modern Ute Tribe. Characterized by the highest peaks in Utah, countless lakes, and a unique alpine ecosystem, it is among the nation’s most outstanding wilderness areas. 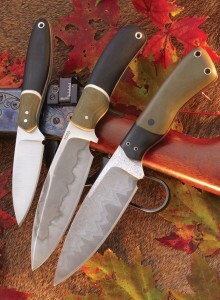 Ryan W. Knives makes knives that have both beauty and function. The satin finish of the High Uintas and the Hamon line found on the Agro are only two different blade finishes Ryan offers. He also offers knives in San Mai steel like on the Agro II knife. This smallish knife is about 8 inches long in total length. The blade is about 3.25 inches long with a useable handle length of about 4.5 inches. This gives up about ¼-inch of ricasso. Handle scales are made up of two-toned olive green and black G10 with white liners. It is the only knife of the batch I received from Ryan made from 1080 carbon steel. The Agro is a medium-sized knife measuring out at 10 inches in overall length. Like its little brother, the High Uintas, it also has a 4.5-inch long handle and two-toned olive green and black G10 scales with white spacers and liners. There is a 3.75-inch rounded swedge on the spine. 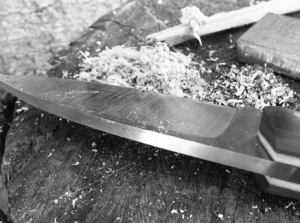 The 5-inch long 1095 carbon steel blade has a very distinct drop to it and a handsome hamon. Agro II is very similar to its counterpart the Agro. It has a larger handle measuring 5 inches long, with a 5-inch long hand-forged San Mai steel drop-point blade. It has a center core of 1095 carbon steel sandwiched between two pieces of wrought iron (from an old anchor chain). The 1095 takes an etch and becomes grey (oxidized), while the wrought iron remains bright. This knife also has the widest blade at 1.5 inches. Handle scales are made up of green and black G10 and four hollow pins. The author made a quick Piute deadfall trap using the Lorien to fashion all the working pieces. Oak and green branches were cut and notched with the Lorien. The KOA wood scales remained comfortable throughout all the work done with the Lorien. S&R (Search & Rescue) is Ryan’s interpretation of what would make an ideal knife for use in a search and rescue scenario. 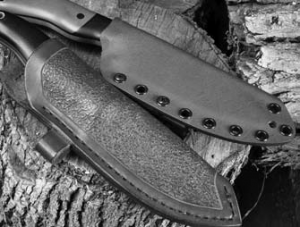 He was asked by a longtime friend to create a knife for a group of Search & Rescue trainees. That explains the 5-inch long handle giving a little extra space for use with gloves, or Paul Bunion type of hands. This is a stout knife. It has a 4.25-inch long leaf-shaped blade with distal taper at the handle and tip of the blade. The thickest part of the spine is 7/32 inches thick and has an elliptical blade design, keeping the knuckles out of the way of a cutting board when slicing or cutting, however, it is slight. The handle scales are made up of black G10 with green liners and spacers and two lanyard holes, one in the middle of the handle, and the other is located conventionally at the end of the handle. The Lorien has an overall length of 10.75 inches sporting a 6.25-inch long blade with a cutting surface of 5.75 inches. The Lorien has a distinct drop to the blade and a nice recurve. One of the thinner knives from Ryan measuring in at 5/32 inches thick, it had a light feel to it due to the slightly thinner stock and thin grind. This blade looks more like a knife that may be seen in an old spaghetti western due to its Bowie styled clip point with a 4-inch sharpened false edge. With a handle length of 4.63 inches long there is plenty of room for medium-sized to slightly larger hands. The handle scales are made of stabilized KOA wood for a natural look and feel, which is quite the contrast to G10. Black liner and spacers give a more modern look to the traditional design, which is a good contrast to Ryan’s other knives. 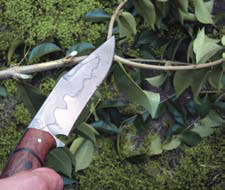 Being that the Lorien has an overall blade length of 6.25 inches, the author opted to make some fuzz sticks using the knife like a reverse drawknife, pushing the blade away from him rather than towards him in traditional drawknifing. Using the blade in this manner, with two hands, gave good control on a knife of this size. There are no rules in knife testing, but I have my own ritual. I open the package and marvel at the unique features of the knives that need to be pointed out, including the sheaths. I select the smallest one for my EDC and hiking trips and then a larger knife for heavier work. During this time, I make it a point to cut various types of materials like food, plant and tree matter that could potentially stain or mark up the blade. I don’t clean or sharpen the knives except at the end of the evaluation, where I will usually just re-sharpen them to see how the steel responds. The High Uinta, because of its size, was the obvious choice for me to select for my outdoors activities like backpacking and hiking. A small knife like this screams to be used for finer detailed work like carving and doing fire prep. I noticed the spine was sharp. Actually, with enough pressure, it could give a decent cut to an unsuspecting finger. A sharp squared spine is actually yet another tool onto itself. The spine shaved down wood with authority making a nice pile of fine wood dust scrapings. It also shaved a nice pile of magnesium faster than any knife blade would, thus saving my cutting edge. I had a quarter-size pile of magnesium in about one minute, and after a quick swipe on the ferrocium rod, the magnesium ignited along with the pile of wood shavings. If I had been cold and wet, this time saver could have saved a life. The Lorien knife is a little bigger than my preferred knife size. To me, that was all the more reason to use it. The best way to get to know a knife is to make something. I spent some time practicing skills and making traps using the Lorien. Holding the knife way back at the end of the handle gave me a few more inches of length and a lot more momentum when chopping thin, green wood and branches. 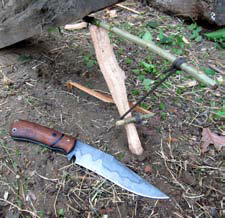 I was making a Piute Deadfall trap and although you can fashion it without cutting tools, where is the fun in that? I used a piece of dried oak for the upright piece and carved a notch into the wood to give a place for the support stick to rest. I used various lengths of green wood for my support stick and trigger, which meant lots of chopping, albeit light chopping at that. The cuts needed to be cleanly sheared and the thin grind on the Lorien made sure of it. 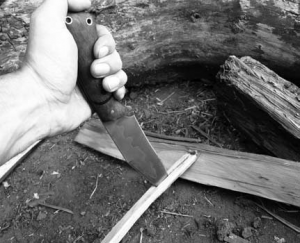 I found myself splitting thin pieces of wood with it by holding the knife in an ice pick grip and driving the tip into the wood lightly, then striking the wood, with the knife in it, down on another piece to complete the split. The sharpened section of the clip-point spine gave excellent penetration for drilling into wood and fine-tip details. I had to resist the urge to put my thumb on this section when using the tip for fine carving since it is sharp. A knife with this blade length also works better as a draw knife for smoothing out wood or harvesting kindling. Again the sharpened spine was an issue, but that is what I get for choosing the one knife with a sharpened spine, can’t blame it on the knife. The KOA wood was very comfortable and really shined when making tough cuts. I would like to say that the blade didn’t come into contact with rocks on followthrough cuts or chops, but that wouldn’t exactly be a true statement. Good thing Ryan knows how to heat-treat his steel. All five knives I received from Ryan were dressed to kill with leather and Kydex pants. Three of the sheaths were fitted with a Tek- Lok attachment, which work well on packs. The knife can also be carried on the left hip (if you are right-handed) and used by cross drawing. This solves the problem of getting jabbed in the ribs, but isn’t for everyone. Leather is the perfect accent for these knives and Ryan makes outstanding leather sheaths in a deep-pocket carry style. Ryan does all his own leatherwork and uses 8- to 9-ounce shoulder. The sheaths can be had with or without a firesteel loop. If you want a knife that has both beauty and function, you won’t go wrong with any knives from Ryan W. Knives. Ryan’s Grandpa Weeks had a favorite saying that went “Only carry a knife if you can back it up.” Any of these knives will definitely help you back it up!